Two goals from Cristiano Ronaldo helped a dominant Manchester United to a comfortable victory at Dynamo Kiev. Rio Ferdinand opened the scoring when he headed in a Ryan Giggs free-kick from the left before Wayne Rooney tapped in Wes Brown's low cross. Diogo Rincon reduced the deficit with a header before Ronaldo nodded in United's third. Ronaldo scored from the spot after Goran Gavrancic handballed before Ismael Bangoura fired in late for Kiev. Victory gave United their third win from three Champions League games this season but never would Sir Alex Ferguson's side have thought they would achieve the result in such a shockingly easy manner. Kiev's defence was poor. Actually to be blunt, they were awful for much of the match. The Ukraine side are taken away to a training camp for a few days before each European tie, but the benefits from that were far from visible on a chilly night at the Olympic Stadium. They looked disjointed against a United side whose attacking wave of Carlos Tevez, Rooney, Ronaldo and Giggs were a cut above sublime. 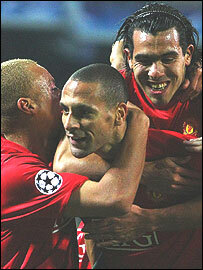 And it was the senior member of the quartet, Giggs, who shone the brightest. The Welshman was on hand to deliver a glorious ball from the left for Ferdinand to power in his first Champions League goal for United early in the first half. What Giggs was doing down the left, Portugal icon Ronaldo was doing down the right. Last year's Premiership player of the year played an important part in the second goal when he seized on a misplaced ball on the halfway line and sped down the wing. Brown, in support, was fed the ball before laying a low pass into the feet of Rooney who tapped in from six yards. Four, five, six goals? It was anybody's guess as to how many United would score following a rampant 20 minutes. But their flow was stopped abruptly by a Rincon who powered his header from Carlos Correa's corner. With the Kiev fans given something to cheer about it was expected the visitors goal would come under severe pressure, but instead United restored their two goal advantage thanks to some more sloppy defending. Giggs made the most of the free space he was gifted on the left to swing in another perfect cross that Ronaldo, unmarked, headed into the keeper's top right. Kiev improved ten-fold in the second half and put the visitors under some early pressure with Correa going close with a 25-yard free-kick and their biggest threat, Rincon, heading narrowly wide. But with the Ukraine outfit employing more men in attack they were becoming increasingly exposed in defence. A typical United break led to their fourth when Tevez was fed down the right and his cross was handled by Gavrancic. Referee Viktor Kassai had to consult his linesman to see whether the offence was inside the area before awarding the spot-kick. With that drama over, Ronaldo coolly stepped up to score his second. Bangoura's beautifully struck low drive made sure United were kept on their toes for the last few minutes of their victory. "The attacking play was excellent - we could have scored a lot of goals. "We had to defend well during some moments in the second half because they they were a bigger threat. "No matter who we're playing we're adapting well. The players aren't worried about new formations." Dynamo Kiev: Shovkovskiy, Ghioane (Belkevich 45), Gavrancic, Diakhate, Gusev, Yussuf, Nesmachniy, Correa (Rotan 83), Bangoura, Rincon, Shatskikh (Milevskiy 45). Subs Not Used: Rybka, Vashchuk, El Kaddouri, Markovic. Goals: Rincon 33, Bangoura 78. Man Utd: Van der Sar (Kuszczak 80), Brown, Ferdinand, Vidic, O'Shea, Ronaldo, Anderson, Fletcher, Giggs (Simpson 80), Rooney, Tevez (Nani 72). Subs Not Used: Pique, Eagles. Goals: Ferdinand 10, Rooney 18, Ronaldo 41, 68 pen.